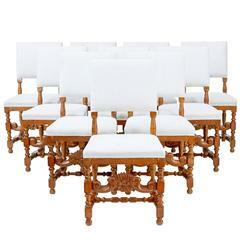 Fine quality set of dining chairs comprising of 2 armchairs and 6 single chairs, circa 1940. We have just had this set upholstered in grey fabric with matching braid, which contrasts superbly with the warmth of the woodwork. Frames made from teak and mahogany which has now taken on a good patina. Flowing back rests and seat. Standing on tapered legs. Cross over design which shows its art deco influence which is pushing towards contemporary. Measures: Seat height 17 3/4" Seat width 20 1/4" Seat depth 18" Arm height 26 1/2" Single chair height 33 1/4" Width 18 1/4" Depth 22 1/2" Seat height 17 3/4" Seat depth 15 1/3". 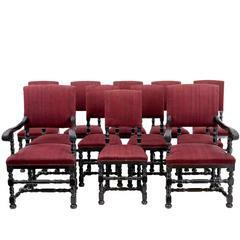 Set of six dining room chairs with ebonized front legs and Bordeaux colored upholstery on seat and backrests. Mid Century Set of eight Scandinavian dining chair in rosewood, 1960s.